BBC News, January 3rd 2011 -- South Korea says it is tightening rules to combat illegal whaling. Although commercial whale hunting is banned in the country, the trading of whales that are found dead is still legal. 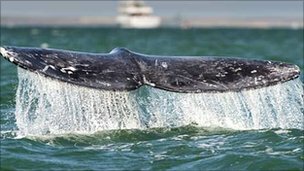 The new rules will require fisherman to report to police immediately if they discover dead whales in their nets or washed ashore. The move comes after critics said some fishermen were exploiting a loophole in the law. The new regulations mean that, from Monday, samples from all dead whales must be given to the authorities for testing, and their meat can only be sold after a full investigation into how the animal died. Those who catch dead whales will also only be allowed to process and sell them at state-designated facilities, South Korea's agricultural ministry said. The new law aims to tackle a "growing amount of illegal whale hunting" around the country, it said, according to AFP news agency. "Once the new measures go into effect, Seoul will be able to better meet allegations of lax oversight raised by some countries and the IWC (International Whaling Commission), and lay the foundation for monitoring marine resources around the Korean Peninsula," a ministry official was quoted by Yonhap news agency as saying. South Korea used to allow commercial whaling but banned it when the IWC implemented a global moratorium in 1986.